Kitchen! Kitchen! 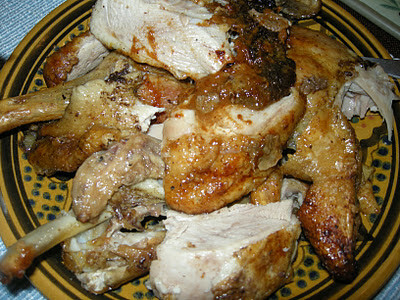 : roasted duck.....may I have some more please!.......at kitchen! kitchen! roasted duck.....may I have some more please!.......at kitchen! kitchen! and a bit of chinese black rice. Another comfort food at my table is a roasted duck stuffed with nothing but my favorite herbs of rosemary, lemon thyme, sage, tarragon, fresh bay leaf, and the reliable garlic cloves. Smashed of course! These herbs goes into the nooks and cranies of the bird that render the duck so heavenly good and hard to resist at the table. I've just discovered that ShopRite has the maple brand duck from Canada, a luscious looking bird that cooks wonderfully than it's counter part that you might find in some other supermarkets. There's nothing like the famous Long Island duck of course, but then I am not about to spend an arm and a leg on a normal family dinner since this bird has been a Saturday dinner staple of ours as of late. Long Island duck is reserve for a very, very special occasion. So for now, I will contend myself with the Canadian one. All the cuts are on the platter- nothing is left out of this bird. That's how good it is! Steamed broccoli and carrots and a salad of cucumber with honey mustard dressing are great accompaniment for the roasted bird. Red cabbage, boiled potato or rice go well with it too. My niece Abegail loves it with lingonberry preserve. 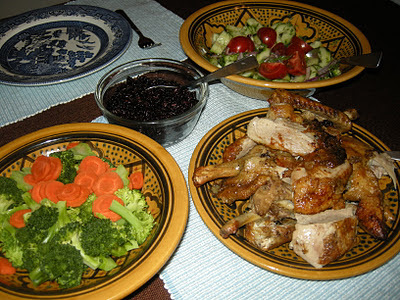 For recipe check out previous posting of roasted duck dated Sept. 12, 2010 (Saturday dinner of asian roasted duck). However, for this dish, I had a little over 3 lbs. of duck. Follow previous recipe and use above herbs or any of your favorite herbs. Bake for 20-30 minutes a pound. I increased the temperature to 425F at the last 30-40 minutes of the roasting to crisps up the skin. Let stand for an hour before carving to allow the juices to re-circulate. You'll be glad you waited. Tip: Include the innards along with the herbs in the cavity for added layer of taste. Chopped up the roasted innards, herbs, and the garlic for your pate. I had a ground pork and veal all seasoned up waiting in the wings for the duck innards. I added a bit of a douse of white wine or cognac to the mixture before incorporating it to the ground meat. (check previous posting for bison pate in pastry- Dec. 15, 2010 and homemade veal pate dated Jan. 13, 2011). Just like hitting 2 birds with 1 stone! !